During the summer months, you'll also enjoy complimentary beach service, which includes two padded chaise lounge chairs and umbrella (a $40 daily value from Mar 1 -Oct 31, 2019). * 3rd Floor Convenience - Middle of Condo - no road noise! This unit is 'Platinum' rated on the 3rd floor with a floor plan which offers both the living area and the master bedroom directly facing the gulf. A 30 foot balcony is accessible from the family room or the master bedroom. Many Tidewater Beach Resort one bedroom units do not have the master bedroom on the Gulf. Our unit also has floor to ceiling sliding doors in order to access the balcony. The bunk room is a separate room with a closet for the kids. The Family Room has a 42' HD LCD TV with DVD / VCR, and a 32' LCD TV with DVD in the master bedroom. Wireless internet provided in this unit! The Family Room has a queen sleeper sofa, and plenty of room to comfortably accommodate six people. A fully equipped kitchen is available for your use. Two full baths are also available -- one full bath is off the bunk room and the other is off the master bedroom. The furnishings are upgraded 'Platinum' quality and the unit was professionally decorated. Tidewater Beach Resort is located 1/3 mile from Pier Park (900,000 sq ft Complex of Shopping, Entertainment, and Dining) on Front Beach Road in the NEW and convenient west end of Panama City Beach. Pier Park opened in the spring of 2008 with such unique restaurants as Jimmy Buffets Margarittaville, Hofbrau Beer Garden, The Back Porch Seafood and Oyster House, Longhorn Steaks, Starbucks, Olive Garden, Wild Wing Café, Reggae J's and Five Guys Famous Hamburgers and Fries to mention just a few. Add to this shopping options such as Dillard’s, J C Penny, Old Navy, Ron Jon Surf Shop, and hundreds of specialty stores for your shopping pleasure! Additionally, enjoy and the 16 screen Grand Theater and IMAX Theater! With the new airport that opened in May of 2010, Panama City Beach is the premier vacation destination in the entire Florida Panhandle! What a great location less than a mile from Frank Brown Park and Back Beach Rd. This is an impressive unit in the new Tidewater Beach Resort Complex that you must see! Free beach chair service (March - October) -- double chaise lounge with umbrella. 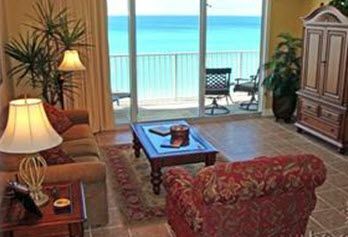 Discover the peaceful sound of the waves and spectacular views directly on the Gulf! Relax, recharge, and enjoy the beauty of the Emerald Coast! Trip with my daughters and a couple of their friends. The condo was clean, nice, and well suited for us. Our stay at Tidewater was very nice, the condo was clean and comfortable. The 3rd floor gave us a beautiful view of the ocean with a nice roomy balcony. Lots of amenities at Tidewater or very close by. Everything was close within walking or very short driving distance. Only concern is lack of rolling carts at check in/check out time and wait time for elevators. They do put elevator attendees on the elevators at time, and that was a big help. Will definitely go back and I would recommend this place to others. Overall happy with the rental company used. Tidewater room 309 was nice and clean with wonderful view. Thank goodness we stayed on third floor because long wait for slow elevators. I didnt like at Tidewater how crowded it was.The view on beach was like a store with all the chairs and long walk to room from parking. Some people might not mind this though.I like it was close to Pier Park and the size of the balcony. The condo was clean overall. They really need to replace the bedroom carpet it was dirty and worn. The kitchen pretty much had what you needed. The location was great looking over the beach. The management needs to limit the collage age students or police them better we were woke up a couple of nights with the drinking parties on the beach below the condo. Great condo for enjoying the beach from the condo. This was our first time in a condo rental. Very good experience. Perfect location in the facility and the beach. Very spacious and nicely furnished. Owner was very responsive to questions and other needs we had. Definitely would look to stay here again in the future. Our unit was well supplied with the necessary items one would need. It was clean & bright, the bed was comfortable, and convenient to everything we wanted. We ae coming back next year to the same unit..